MacOdrum Library - Carleton's Institutional Repository: PCI-SS: MISO dynamic nonlinear protein secondary structure prediction. 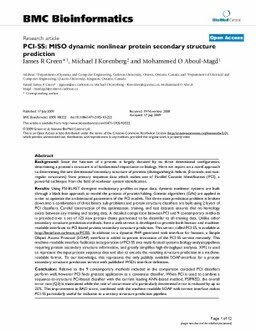 PCI-SS: MISO dynamic nonlinear protein secondary structure prediction. BACKGROUND: Since the function of a protein is largely dictated by its three dimensional configuration, determining a protein's structure is of fundamental importance to biology. Here we report on a novel approach to determining the one dimensional secondary structure of proteins (distinguishing alpha-helices, beta-strands, and non-regular structures) from primary sequence data which makes use of Parallel Cascade Identification (PCI), a powerful technique from the field of nonlinear system identification. RESULTS: Using PSI-BLAST divergent evolutionary profiles as input data, dynamic nonlinear systems are built through a black-box approach to model the process of protein folding. Genetic algorithms (GAs) are applied in order to optimize the architectural parameters of the PCI models. The three-state prediction problem is broken down into a combination of three binary sub-problems and protein structure classifiers are built using 2 layers of PCI classifiers. Careful construction of the optimization, training, and test datasets ensures that no homology exists between any training and testing data. A detailed comparison between PCI and 9 contemporary methods is provided over a set of 125 new protein chains guaranteed to be dissimilar to all training data. Unlike other secondary structure prediction methods, here a web service is developed to provide both human- and machine-readable interfaces to PCI-based protein secondary structure prediction. This server, called PCI-SS, is available at http://bioinf.sce.carleton.ca/PCISS. In addition to a dynamic PHP-generated web interface for humans, a Simple Object Access Protocol (SOAP) interface is added to permit invocation of the PCI-SS service remotely. This machine-readable interface facilitates incorporation of PCI-SS into multi-faceted systems biology analysis pipelines requiring protein secondary structure information, and greatly simplifies high-throughput analyses. XML is used to represent the input protein sequence data and also to encode the resulting structure prediction in a machine-readable format. To our knowledge, this represents the only publicly available SOAP-interface for a protein secondary structure prediction service with published WSDL interface definition. CONCLUSION: Relative to the 9 contemporary methods included in the comparison cascaded PCI classifiers perform well, however PCI finds greatest application as a consensus classifier. When PCI is used to combine a sequence-to-structure PCI-based classifier with the current leading ANN-based method, PSIPRED, the overall error rate (Q3) is maintained while the rate of occurrence of a particularly detrimental error is reduced by up to 25%. This improvement in BAD score, combined with the machine-readable SOAP web service interface makes PCI-SS particularly useful for inclusion in a tertiary structure prediction pipeline.